Rev. William V. McDonough, CSV, died at the age of 65 on Thursday, March 6, 1980, after a long illness. He was a priest for 35 years and in the 43rd year of his religious life. 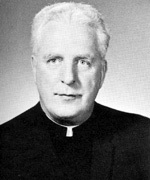 Father McDonough entered the Clerics of St. Viator in 1936; he graduated from St. Ambrose College where he received a Bachelor of Arts degree in 1940 and a Master of Arts degree in history from the University of IL in 1942. His theological studies were at the Catholic University of America Washington D. C. and he was ordained to the Priesthood May 20, 1945. 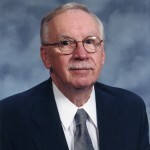 During his teaching career he taught at Cathedral High School in Springfield, IL, St. Philip High School in Chicago, Loyola University of Chicago, Marian High School in Chicago Heights, IL and Brother Rice High School in Chicago. At the time of his death he resided at Queen of Martyrs Rectory in Evergreen Park, IL. A wake was held on Saturday, March 8, 1980, at Sheehy Funeral Home in Chicago from 3 – 10:00 pm with wake service at 7:30 pm and on Sunday, March 9, 1980, from 12 – 4:00 pm. The Mass of the Resurrection was on Monday, March 10, 1980 at Queen of Martyrs Church in Evergreen Park, IL. Burial was at Queen of Heaven Cemetery in Hillside, IL. Please remember Father McDonough in your Masses and prayers. Taken from a Provincial letter from Rev. Kenneth Morris, CSV and a press release from the office of the assistant to the provincial.